When it comes to eating whole foods there is nothing better than adding a little extra protein here and there to keep you satiated throughout the day. We eat at least 6-7 servings of fruit and veggies per day as we love the idea of rainbow eating (as many colors in a day as you can). As you would guess, Dexter and Oliver adore all fruit. Some of their favorites include grapefruit, kiwi, strawberries and blueberries. Actually, they love all berries! 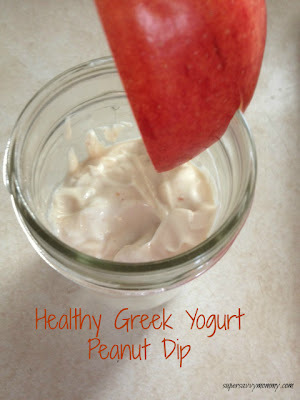 When I heard of someone mixing peanut butter with greek yogurt I got all kinds of giddy. I thought, YAY protein, flavor, dipping action, fun! I was all-in. The result was this creamy, sweet, indulgent treat that packs a whopping 13 grams of protein per 1/2 cup. The calories sit at a mere 110 so this treat really is sinful without tipping the caloric scales away from your health goals. Do you have an awesome healthy dip recipe for fruits or veggies? I'd love to hear all about it! We do a fruit dip in my family. Its equal parts vanilla yogurt and whipped cream. We usually do not fat cool whip. A dash of nutmeg. And orange juice til its not so thick. About the consistency of shampoo. Its great with all fruit. I like it with Mellon. This looks yummy! Thanks for the idea. Yummm-o! Quick and simple. Thanks so much for sharing a delish recipe. Mmmm... Looks good! Think I can sub agave for the honey?